There were no half dimes minted in 1798 or 1799. In 1800, a new reverse was introduced, this one featuring a large (also called heraldic) eagle. The eagle was based on the Great Seal of the United States. There are five known varieties of the 1800 Draped Bust Large Eagle Half Dime. The only one that truly carries a separate identity is the LIBEKTY variety, which was caused by a defective R punch. In spite of this oddity, the LIBEKTY variety does not especially carry a premium value. By today's standard, a defective tool such as the R punch used to "spell" LIBEKTY, would not be tolerated. The early Mint had no such luxury, as resources were scarce. As long as the tool was semi-functional, the engraver had no choice but to use it. There is another variety fairly easy to notice. This variety is defined by a goofy 8 in the date 1800. The 8 was placed onto the die by using two small "o" punches, one sitting above the other, resulting in a rather amateurish appearance. At least on this variety, the word LIBERTY is spelled correctly! 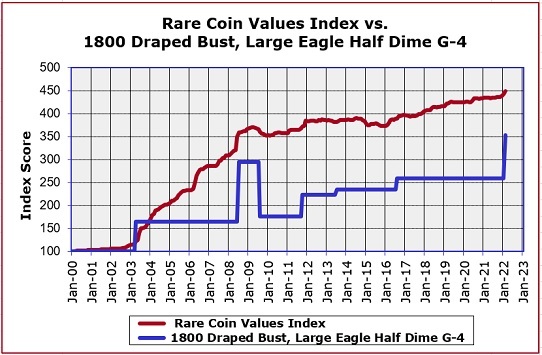 The blue line charts the Index score (which is really just the percent increase) of the 1800 Draped Bust Large Eagle Half Dime, as is has changed since the Year 2000. The red line is the score of our overall Rare Coin Values Index, which computes the percent change over the same period of time for a sampling of 87 rare US coins, which includes the 1800 Half Dime. The goal of the Index is to chart the direction of the US rare coin market in general, and is updated every month. We could have included the famous 1802 Half Dime in our study, but because of its extreme rarity and value, very few coin collectors realistically have a chance to own it. The 1800 is a rare coin in its own right, but is attainable for a much broader class of collector.